There are so many feature length films nowadays that should really have an hour of them removed because they try and do too much in the one film. Story telling has been lengthened and not always for the benefit of the film or for the audience. Christopher Nolan has perfected the art of creating a story that ebbs and flows in such a way that enthralls the audience for the entire time. 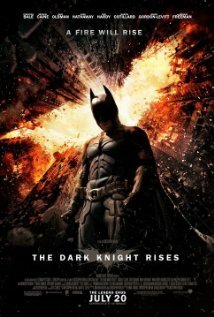 The Dark Knight Rises is a long film but it didn’t feel like the 2hr 44min that it claims to be. It may be that I was just overly excited by the perfection of Nolan’s writing once again, or that the adrenaline and excitement got to me, but the film just picked me up and carried my imagination through it without a hiccup of lost concentration. I have to admit I wasn’t that excited about going to see The Dark Knight Rises. Especially after being disappointed with The Amazing Spider-Man (see review here), I really didn’t want to get my hopes up too high to be crushed again. But to the contrary I was blown away and riveted the entire time. The narrative of this film is as brilliant as the previous two with its own little twists and turns along the way. I think I got so involved in the film that when one of the big reveals happened and my friend beside me whispered “I knew it!”, I was still rolling in the amazement of it. I now can see how one could have predicted the twists but I was enjoying the ride too much to take that step back and think about what was coming. The amazing thing about this film was the audience’s response. I saw the film the second night it was out, with a packed theatre. There are particular moments in the film when the sound becomes basically silent and it was in these moments when I realised how involved the audience was in this story. There was barely a rustle of lolly papers or crunch of popcorn to be heard in the entire theatre. The power of this film was astonishing. It hooks you in and doesn’t let you go until those lights are lifted and you are jump started back into the real world. I know that this will not be the experience for everyone but it certainly was mine and I truly hope that you’re experience of watching The Dark Knight Rises is as thrilling as mine. The only aspect of the film which I wasn’t completely satisfied with was that of the villain, Bane. The Dark Knight Rises is the end of a trilogy that has been acclaimed for more reasons than it’s brilliant story lines and production values but it has been shrouded in some sadness and drama of its own. The loss of the brilliant Heath Ledger before The Dark Knight came out in 2008 was tragic and the film will always hold that external loss to it. However the beauty of his performance in The Dark Knight was the thing that really gripped the audience. He played the Joker so incredibly well that I still have nightmares when I see pictures of him, let alone watch the film again. And thus, it was always going to be hard to create another villain as tremendously terrifying as The Joker. This is the only fault I find with the new film. The villain doesn’t give me nightmares. And this I attribute purely and simply to the voice of Tom Hardy (Inception, This Means War). Hardy’s British accent didn’t suit his villainous look. It wasn’t monstrous or maniacal, it was simply plain and had barely a hint of evil apart from the words which formed the dialogue. Maybe that was what was meant to be so terrifying about him, that he was just one of the normal people, that it wasn’t because he was a raving lunatic but that he was simply a causer of havoc and discord. But after Heath Ledger’s performance there was a certain level of expectation and it wasn’t fulfilled for me. However, in saying that, it was still thrilling to see Bane unfold as a character and how Catwoman (Anne Hathway) was worked into the storyline as well. I really loved Hathway’s portrayal of the woman behind the spandex and how Nolan created her character outside the seductress. The other outstanding performance was that of Joseph Gordon-Levitt whose character was surprising and beautifully portrayed. Nolan tends to use the same actors throughout his work with good reason, they suit his dramatic style of writing and make what could’ve been a really cheesy line quite beautiful and genuine. The passion and depth to each character was explored throughout the drama and provided the reality that a comic film needs to be truly identifiable with our real world. It is the characters challenges, triumphs, and losses that make this trilogy the wonder that it is. 2 things about Bane’s voice: 1) I kept thinking it was Sean Connery 2) I think it’s power lies in its dissonance, which made his overall character menacing. That is, you see him, a hulked-out guy in a mask, and you expect Arnold Schwarzenegger, but instead you get intelligent and thoughtful that just so happens to sound like James Bond, and you think, ‘who the heck is this guy?’ and then he beats the living daylights out of you. Knowing the comics, I find this a fairly good portrayal of that character, though it is true that none will really compare to the Heath Ledger Joker. Oh no, I don’t think he sounded like Connery at all. But maybe that is just my flawed memory. Maybe I’ll have to see it again. I get what you are saying though but it just didn’t hit the right note for the creepy factor for me. I’m glad that it portrayed the comics well though, that’s always a bonus.